Billy Joe (Robby Benson) pursues his local sweetheart, Bobbie Lee (Glynnis O’Connor), while harboring secret fears that he may be homosexual. In her popular country ballad “Ode to Billy Joe”, Bobbie Gentry infamously sang about how “Billy Joe MacAllister’s jumped off the Tallahatchie Bridge”, yet left the reason for this drastic action a frustrating mystery. 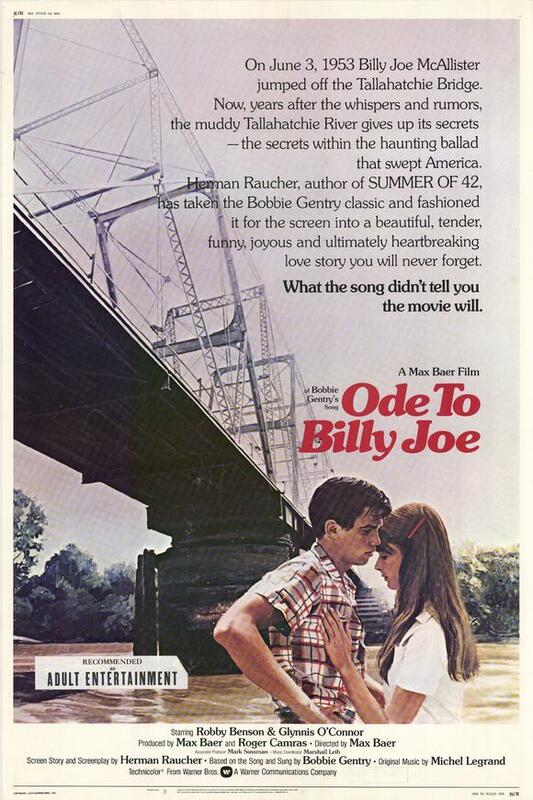 This film (starring real-life teen lovers Glynnis O’Connor and Robby Benson) is a cinematic attempt to fill in the song’s gaps, yet ultimately isn’t quite successful — primarily because Billy Joe’s “sudden” discovery of his homosexual yearnings doesn’t jive with the intensity of his passion for Bobbie Lee. While his melodramatic reaction to a disturbing liaison at the county fair can easily be excused, Billy Joe (at least as played by Benson) is ultimately too vibrant and hopeful to wantonly throw his life away over this. Despite its narrative flaws, however, Ode to Billy Joe remains compelling viewing in many ways, primarily because of the star power of Benson and O’Connor, who have enormous chemistry together. O’Connor’s Bobbie Lee — caught in the throes of adolescent individuation — is an especially fascinating and complex character; she speaks in risky double entendres (“The plumbing’s in — and you’re next!” she says slyly to Benson), and isn’t afraid to share her frustrations openly with her parents: “There I am, all primed up to be a woman, only I’m not allowed to be anything but a child!” As always, O’Connor creates a character who you’d like to know in real life, and who you’re sorry to say goodbye to once the film is over. No, but it’s worth watching. Ugh, what a tedious film! Bobbie Gentry’s famous song was, indeed, such a smash hit (I recall hearing it constantly on the radio) that it seems inevitable that a film would follow to flesh out the mystery of the lyrics. But therein lies the major problem: making an entire film for the main purpose of unraveling a secret. A tricky endeavor at best. None of this is at all helped by Herman Raucher’s decidedly awkward, over-written screenplay. Director Max Baer and his cast (with the exception of the somewhat-limited Benson) do their best with the thin/often forced material. O’Connor does stand out (even if she’s presented as way too wise for her years and experience), but her adolescent plight recalls the similar, more believable realization of Sondra Locke’s Mick in ‘The Heart is a Lonely Hunter’. The conclusion is something of a nonsensical, maudlin mess; and the story’s homosexual aspect – the whole point of the film – is oddly shrouded and not all that convincing.